Menu planning, couponing, making a budget–it’s all so overwhelming. I want to be a good steward of the money God blesses us with and my husband works so hard to make, but I think I’d rather do most anything than figure out how to save money on groceries. In the past, I have found it time-consuming, confusing, and frustrating. e-mealz makes menu planning so easy by providing a weekly menu plan for 4-6 people, complete with recipes and a grocery list. The budget using the guidelines from e-mealz averages $75 per week. I spend more than that for our family of 3, so I was excited to try e-mealz. There are more than 20 options from which to choose. 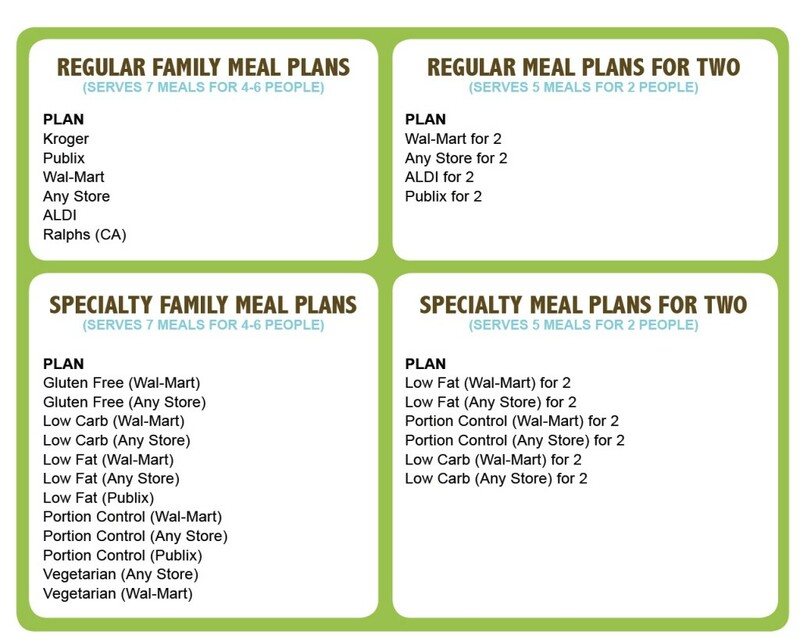 You can choose menus based on which store you prefer to shop (Kroger, Aldi, Publix, Ralph’s, Wal-Mart), how many people you will be feeding (families or meals for two), or food preferences (vegetarian, gluten-free, low-carb, low-fat, portion-control). I generally grocery shop at Kroger, so I chose the Regular Meal Plans for Kroger. There is an option for “any store” if you don’t have access to one of the store options, but you will miss out on the match-up with the weekly store sales, which I think is one of the huge benefits to e-mealz. 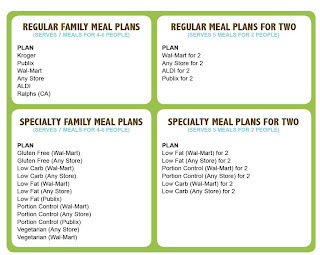 Click here to see a sample of the menu plan and grocery list for the “any store” option. As you can see, it’s easy to print out the PDF document to take shopping with you. Everything you’ll need to purchase, as well as recipes/instructions, and needed staple items are there at your fingertips. No one is my family is too picky, so we were all excited to try some new recipes. I wanted to really test the full-effect of using e-mealz, so I printed off the first week, went shopping, and cooked 5 out of 7 meals. These meals included: Cheesy Chicken Bundles with roasted red potatoes and green beans, Lasagna Casserole with mixed vegetables and garlic bread, Spaghetti Carbonara with Caesar salad, Chicken Divan with rice, and Amazing Enchiladas with black beans. We found all of the meals to be easy to prepare, and most were pretty tasty. We loved the Cheesy Chicken Bundles and Amazing Enchiladas and have actually made them a couple of times since. Ben enjoyed helping me cook and because the recipes are so easy to make, he could really fully participate. For me, easy is always good. I’m often limited in time (aren’t we all?) and I lack great cooking skills. I don’t know that e-mealz is something I would use every week. There are just some days/weeks when we want to cook our tried and true favorite meals. But for extra busy weeks, or weeks when we need to tighten the purse strings, it would be beneficial for me to have these guidelines. I probably wouldn’t find it as helpful if I lived in an area of the country that doesn’t have the listed grocery stores. Having recipes for a family of 4-6 is nice because there was almost always food left over for lunch the next day–another great way to stretch our food budget. If you have a larger family, most of the recipes would double nicely. At a cost of $1.25, you can’t beat the price. Even if you only use it for the recipes, the cost is reasonable! They do charge you $15 for 3 months at a time from your credit or debit card, with automatic renewal. But, you can cancel at any time. The downside is that you do have to choose ONE plan to follow. You can change to another plan only once during your 3-month subscription. So if you have a gluten-free child, a husband who is eating low-carb, and you’re trying to portion control, all while shopping at Kroger, well, you can’t have every one of those meal plans. I would love to have been able to switch things around a bit more and try different types of recipes. Overall, I love the idea of e-mealz. Out of about 6 weeks of meals, I only saw 2 duplicate meals, which is pretty amazing when you think about it. I know at our house, we have some meals we end up eating every week or 2 due to my lack of planning and creativity. Give e-mealz a try. I think you’ll like it. It’s as easy as . . .
See what other members of the TOS Crew thought about e-mealz.